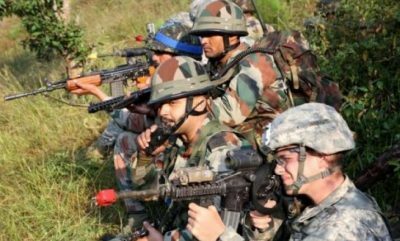 India’s in the unique position of simultaneously holding military drills with New Cold War rivals Russia and the US, though the message behind this diplomatic maneuver is different for each Great Power and varies depending on their perspective. India pulled off a unique diplomatic feat by simultaneously holding military drills with New Cold War rivals Russia and the US, albeit on completely different scales and in different parts of the South Asian country, thereby epitomizing its policy of “multi-alignment” in “balancing” between Great Powers. The immediate impression that one has is that New Delhi is trying to convey “neutrality” by showing the world that it refuses to take sides in this global struggle, so much so that two of its main protagonists apparently “trust” it enough to hold separate military exercises on its territory at the same time as one another. Of course, those with even a cursory knowledge of international politics would know that neither Russia nor the US had any say in the timing of these drills and that it was entirely India’s own initiative to host these two rivals’ militaries at the same time, but that they nevertheless couldn’t refuse to participate in this soft power show because of the fierce competition between both of them over India itself. Accordingly, far from “reassuring” each of them of India’s “loyalty”, this stunt might have actually made them much more suspicions of its intentions, though to different degrees for each one. From the American viewpoint, some might understand why India can’t rapidly disengage from Russia in spite of its newfound military-strategic partnership with the US, though others might question whether New Delhi is doing enough and ask themselves if it’s just manipulating the US for its own purposes. Concerns about India’s overall commitment to the US’ “Indo-Pacific” vision, which crucially excludes any role whatsoever for Russia, might be why trade talks have stalled between the two Great Powers. While it could be assumed that this is to Russia’s relative benefit, that might not actually be the case. India has been gradually decreasing its purchase of Russian military equipment over the years as it seeks to diversify its erstwhile dependence on Moscow by replacing it with the US, “Israel”, and France, which is actually why America didn’t impose CAATSA sanctions against it for the S-400s. From one Russian angle, it’s a relief that India felt confident enough with its “multi-alignment” policy to hold drills with it at the same time as it’s also doing this with the US, but from the other, this serves as a reminder that India has other privileged military partners now and that Moscow must more actively compete for it. It’s become fashionable to analyze international events from the “win-win” perspective nowadays ever since China’s Belt & Road Initiative (BRI) popularized this paradigm (at least when it comes to sloganeering), so with that in mind, India’s simultaneous hosting of military drills with Russia and the US works out to every Great Powers’ interests. Be that as it may, the “zero-sum” perspective is still exceptionally relevant because it informs observers of how India’s actually leaning closer to the US than Russia in spite of the superficial optics suggesting that it’s struck a “balance” between the two.